This is part of a long-running series of articles known as the Guide to Suit Style, covering everything from the number of buttons on a suit to the difference between made-to-measure and bespoke. It will continue to be added to over the next few months. You can see the full contents, and browse between the articles, on the right of this post. For business or generally formal suits, colour is pretty simple – but there are still a few ways to make sure it’s just right. The standard colours are navy and grey, and for good reason: no other colours can both look smart and flatter a man’s skin tone at the same time. Black is too harsh; brown isn’t smart enough; tan is downright casual. The colour needs to be dark to be businesslike, but that doesn’t mean it should be almost black. 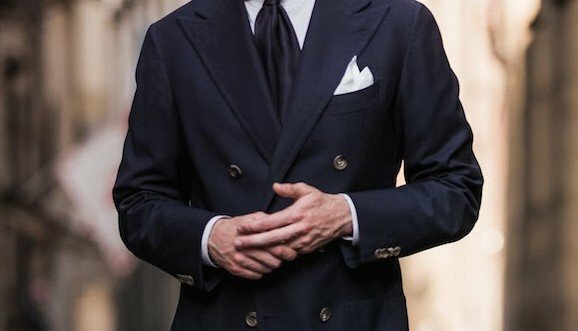 Navy is the classic blue for business suits. Sometimes men buy suits that are too dark (closer to midnight blue, a tone often used for evening wear and which looks black until closely inspected), and that can make them look pale and pasty. But on the other hand, strong mid-blues (almost electric blue) have become popular in recent years, particularly at weddings. These are too strong in colour for most offices – particularly when combined with tan shoes, which seems to be the default. Most of this applies to greys as well. Sometimes men wear grey that is very, very dark, almost black and with little texture. The most useful jacket for business is likely to be a navy blazer, but how acceptable this is will vary considerably between offices. Nice options beyond that for jackets will largely be muted ones such as a pale oatmeal colour or greys. Going beyond business attire – or for more casual offices – will take you into the areas of brown, green and various shades of tan. These can seem rather daring until you look at tweed – the casual attire of traditional English dress and most commonly in shades of green or brown. Both can work in suits or jackets in any material, but remember that lighter colours and stronger colours are more casual. So in a suit, both brown and green should have a touch of the grey about them, and they should be dark enough to look designed for work, not play. 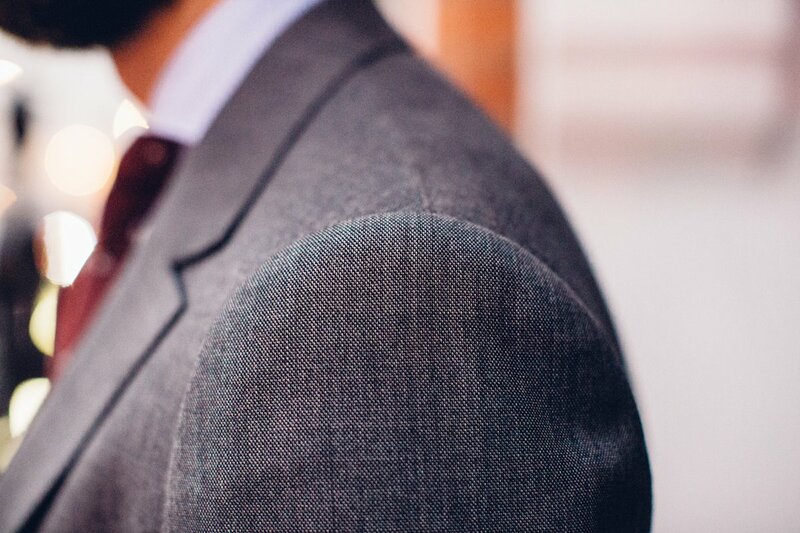 If you’re commissioning your first suit, make it plain. There’s enough to worry about with fit, style and colour, without chucking pattern into the mix as well. 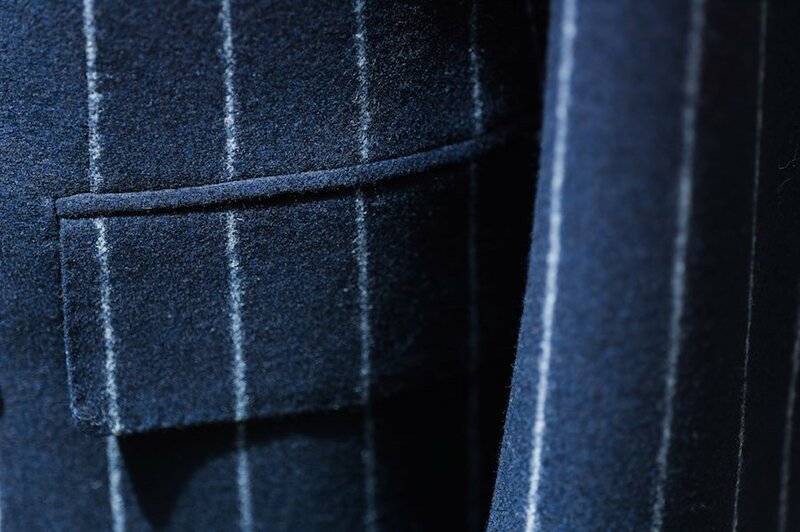 But, plain is rarely plain with worsted wool (the material most business suits are made of). There are nailhead and pick-and-pick, both of which most men would just describe as plain, and even some herringbone patterns go unnoticed. In general, a little surface detail is a good thing. Unless the desired look is ultra-smooth and sleek, texture adds to the interest of a suit and contrasts nicely with the shine of a tie. So consider those little patterns to be nothing more than texture. If you do want a pattern, I’d also suggest starting conservative. With stripes, most you see are pinstripe: a thin line of white or a similarly pale colour that contrasts with the background. It’s easy to see how to go wrong here – a stripe that is strong, wide or widely spaced will be tempting, but threaten to look unprofessional, verging on Wall Street caricature. Equally, though, the stripe should not be so dense as to be nothing more than texture. It’s such a waste. The nice thing about stripes is they give an impression of height and therefore flatter shorter men. Unless you are freakishly tall, though, they will not look bad on a big man. The lengthening effect is far greater than the slimming one. Another popular option is chalk stripe. This is wider and usually used on flannel, creating a fuzziness to the line that is both classic and flattering. Try it on a blue suit and team it with sober accessories. Not rakish, but still full of personality. The king of the check is the Glenurquhart plaid, often reduced to simply glen plaid. This is a check of several overlapping lines that was made famous by Edward VII, who created his own version when Prince of Wales (a glen check with an overcheck is often referred to as a Prince of Wales check). The Duke of Windsor popularized the pattern during his travels to the US. At its faintest, this check is mere surface interest; at its strongest, it is old-fashioned sportswear and unsuitable for business. The difference is both in the size of the check and the tone of the grey (or occasionally blue) that it is set against. Start with a mid-grey and then experiment. The real fun though, is the overchecks. This is a simple, single line that follows the undercheck but outlines it, adding a subtle touch of colour to the pattern. Blue is standard and safe, lime green is surprisingly popular, and pink also pops up now and again. But the king is a rusty orange. Try it on your fifth suit. Last are windowpane checks. 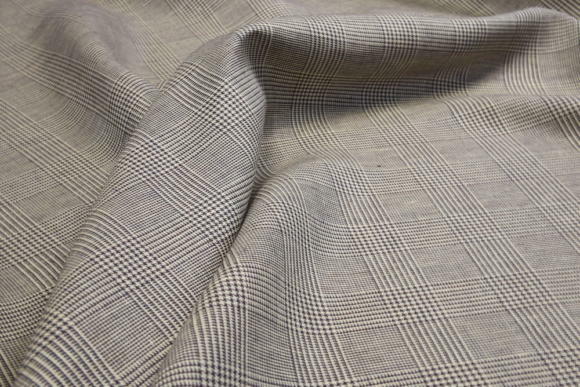 A simple pattern created by single lines, this plaid can again vary enormously in its effect from anonymity to recklessness. A good idea would be to start with a large but faint windowpane on a charcoal ground. You can follow the discussion on Suit Style 5: Selecting colour and pattern by entering your email address in the box below. You will then receive an email every time a new comment is added. These will also contain a link to a page where you can stop the alerts, and remove all of your related data from the site. 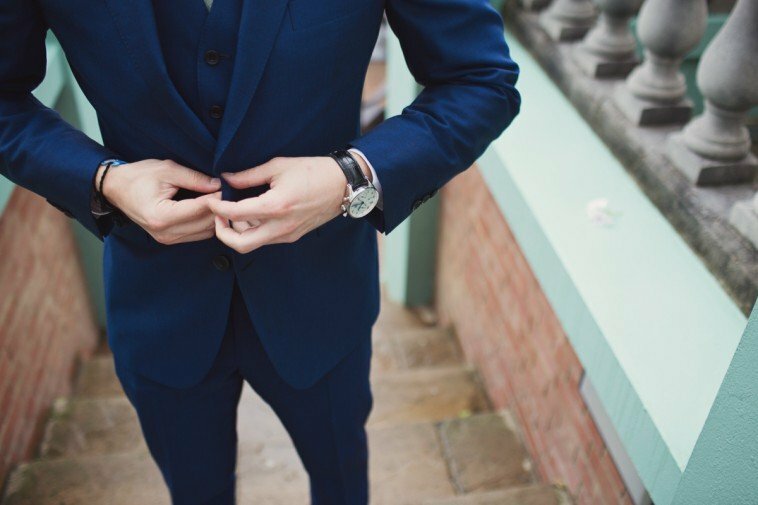 I was hoping this article would touch on a question I raised a few years ago that you said you’d address in a post… without going full blown black tie how do you differentiate between a business suit and something you’d wear for a fairly formal evening event? Since raising this question last time I’ve added a dark navy (but def navy not midnight blue) twill suit to my small wardrobe which I hoped would fit the bill but it still feels to me that I’m the guy thats just come from the office. It’s very much down to the suit too. In the UK at least, there is an accepted convention for formal events where the dress code stops short of morning dress or black tie. Think Remembrance Sunday, or any state function. Odd jackets are out, as are chalk stripes or checks, and light colours. Essentially, it leaves just plain navy or charcoal grey. Shirts should be white or blue. A subtle stripe is acceptable, but bold patterns like Bengal stripe are not. Doesn’t this depend entirely on the event in question ? Over the years, I’ve ran the gambit of just about everything and there is no uniformity. It depends entirely on where you are going , why you are going there and who you are. Yes it does a lot David, but there are still useful things to say about what is more formal, and less office-like, so you can try to pick from those options, I think. I also think the style of suit matters. Peak lapels vs notch, with the former being more formal. And accessories would lift it from an office look because they add layers to the over all outfit. Tie pin, boutonniere, lap pin, pocket square, cufflinks, etc. Good point on peak lapel. 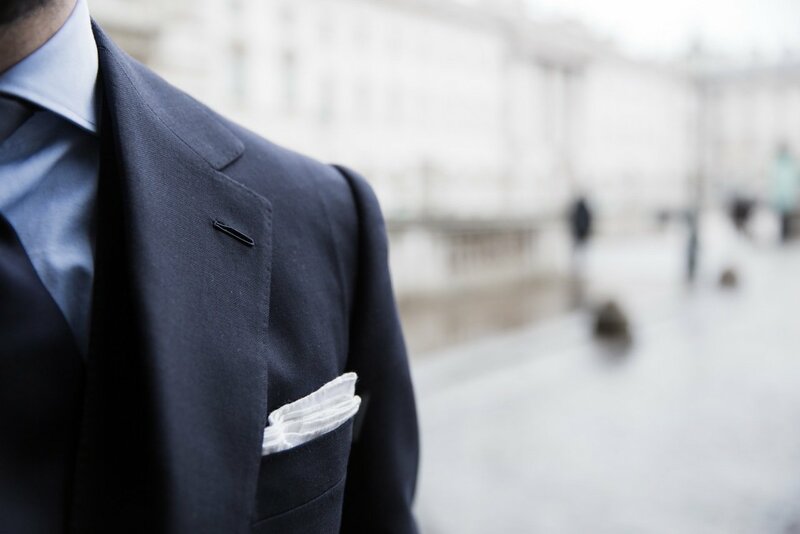 But who would wear a SB with a peak lapel to the office…………….? Your article “Peak Lapel Single Breated” dated 11 July 2012 suggests otherwise Simon. I still don’t like peak lapel suits generally, I was saying here rather that I would have no problem doing so from a formality and propriety point of view. I would think it perfectly acceptable in most offices. Material can be a point of difference too, maybe flannel for the office and a wool/mohair mix for a more formal suit. I am in the (mental) process of ordering a grey jacket for fall/winter, but I am struggling to choose between houndstooth, pow and herringbone. I am moving in the direction of a houndstooth, but I worry that this may be to informal and difficult to pair with other stuff. My office is business casual (I can wear more or less what I like, except navy suit), and I will wear this jacket once a week. I would be grateful to have your thoughts on this matter. If you don’t have something similar, Anders, I would go with herringbone. You will likely find it the most versatile, and given your uncertainly here there is a decent risk you spend a lot of money on something you’re not entirely happy with – so I would play it safe. I think that to work well on a single breasted coat, a peak lapel has to be quite strong. This, for me, is why it sits better on a dinner jacket, which calls for a bit of drama, than does on a lounge suit. I have found that, If you have to go straight from office to party, changing your “work” tie with a bowtie gives you a “festive” look quite different from the office one. Excellent article Simon! One dilemma I constantly deal with is the issue of model, two or three button. For a while I’ve been primarily a three button man, but now am considering going back to the two button model. Do you have a preference and if so, why? Forgive my slightly un PC comment, but how can this be a dilemma with which you are struggling? Asking for advice on two or three button fastening is a bit like asking if you should favour sauvignon blanc over pinot grigio. Are you 6′ 3″ and 16 stone, or 5′ 10″ and 10 stone? An accountant or architect? 25 years old or 60? Living in a big city or the countryside? Do you wear a 60 year old Timex or a Swatch? Simon, try and give a helpful answer to a helpless question. I have a Crispaire navy suit and a Fresco III 14/15ozs 430g navy suit. Which navy cloth do you recommend next? I was thinking of trying a VBC high-twist if it’s substantial enough. It’s a wardrobe of uniforms — single breasted navy suits. Weather concerns: I live in New York. Secondly, what do you think of discreet action backs on otherwise formal suits? With a fitted garment, I don’t get a full range of motion like a t-shirt. On the other hand, the Fresco III does give me a full range of motion but is unflatteringly boxy. Or does a formal fitted jacket always restrict some motion? I get my suits from Whitcomb, if that helps. It sounds like you could do with some variation in the material – how about trying a flannel or a worsted with some texture in it like a herringbone or birdseye? I can’t go with your descriptor of blue chalk stripe flannel as ‘not rakish’. The aforementioned teamed with a blue, washed out and slightly frayed open necked vintage denim shirt together with dark brown suede boots is the epitome of louche rakishness and represents, in the ‘ right hands’ , sartorial black belt excellence. My traveling companion and ‘Permanent Style’ sensei, Jason King, is a leading proponent of this look. Of course, it’s way to sophisticated for the ‘Pitti’ me gang. Jason King wouldn’t be seen dead in denim. In the video work you’ve done for PS, have you noticed any issues with moiré on pattern suit materials? Whenever I have done video material for work, the advice given has always been to avoid finely-spaced patterns because of the distracting “moving” effect they can cause on playback. 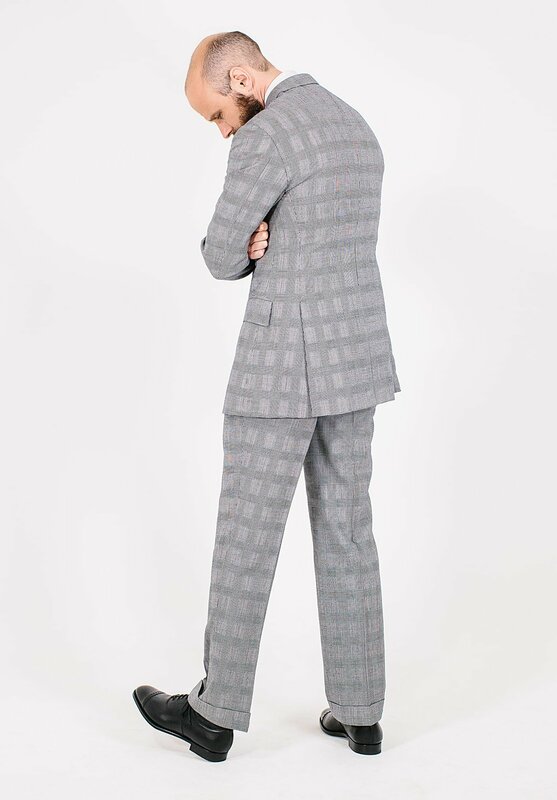 For striped suits this isn’t an issue as the spacing is suitably wide (unlike a pinstriped shirt, for example). But I would have thought that the glen check or herringbone pictured here, beautiful as they are, would be likely to cause problems. I am curious to know whether that has proved to be the case or not? Perhaps I didn’t express myself very clearly, I meant the effect described below, not the material after which it is named. The moire effect on video can be an issue although modern cameras seem to be able to resolve this. I do a lot of Bloomberg and CNBC video interviews and their cameras are able to resolve most fine patterns. 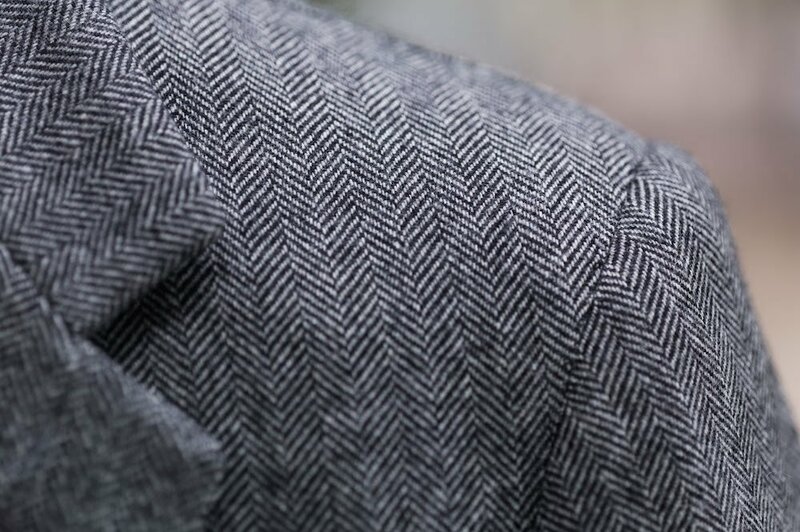 Herringbone tends to be sufficiently fine that the moire effect doesn’t happen. Unless the herringbone is too coarse. The same can be said of glenchecks where the check is subtle enough. I think where it can arise is if you’re wearing a coarse and heavy twill. For TV I just play it safe and wear plains or stripes. Hi Simon, do you think grey trousers would look good in cavalry twill (as an alternative to flannel)? I completely agree with your comment regarding black. It always looks cheap. Think bouncer, driver, hired help. I made the mistake of buying a black silk suit from Richard James some years ago and wore it once. When Trunk Clothiers first opened I remember one of the staff commenting that the owner Mats would not stock black suits, jackets or trousers. I’m sure that Mr. Tom Ford, a big proponent of black, would disagree strongly with you in this regard. Are you suggesting that men wearing black tuxedos look like bouncers or drivers? Black can work OK on fashion types looking for high contrast, and work OK in photos. But it is not flattering on most men. It’s generally better in black tie than other areas, but it tends to look a little dusty and faded under artificial lights – one reason a lot of men go for midnight blue instead. Black is a very polarizing color it seems, people either love it or hate it. Would you recommend midnight blue for a tuxedo rather than black? If a man has a black suit and/or a black blazer in his wardrobe should they be purged in favor of grey or navy? Grey or olive shirt to tone down the contrast? Contrast isn’t the problem really – you’ll get that with strong navy as well. And if anything grey might make the whole thing look quite washed out. What’s your opinion of slanted pockets or a ticket pocket on a formal/business suit? A ticket pocket would have been a standard feature on a very classic DB, or SB three piece in the 60’s-late 80’s, but a bit anachronistic nowadays, only really only to be found on a sports/hacking jacket. Slanted pockets can actually elongate but the flaps have to be out otherwise they look a bit odd, unlike a straight flap which can be tucked in for a bit of difference. If grey trousers looks good with a navy jacket, why not wear navy trousers with a light grey jacket? Seems to me that if one works, the other should work as well. It’s light grey herringbone, and I quite like the look. Is the fact that it’s relatively light weight at 8.5 oz a red flag? Would such a lightweight cashmere still drape fine in the back, and do you think it would be wrinkle resistant at all (one thing I like about good quality worsted wool is that it’s naturally fairly wrinkle resistant). Finally, do you think this would be pretty versatile? I’m an attorney and I would describe my work environment as relatively informal–we still wear traditional suit and tie when meeting clients, but otherwise separates with or without tie. Since I do like wearing suits, my solution has been to “dress down” my suits with by pairing them with more casual ties, or to wear suits that are inherently less formal (like hopsack or wool/linen blend in the summer). But I’m on the lookout for a versatile sports jacket besides a navy blazer that I already own, and a greenish tweed that’s better suited for weekend attire. It’s not that simple unfortunately. Trousers generally work better in simpler, plain colours. You don’t wear a plain jacket with windowpane trousers, for example, and in general dark jackets are always easier to pair with lighter trousers than the other way around. The jacket is a nice colour, and I think you would find it quite versatile though. Nicest with grey or charcoal trousers, possibly other warmer colours like dark brown or dark green too. Similar to my Hitchcock jacket. I’d avoid the look pictured – bright blue trousers with mid-brown shoes is not a great look (though a very popular one at the moment). Thanks so much for your reply. What weight range would you recommend for cashmere? What would be your minimum? Bottom line seems to be that cashmere is not a realistic proposition for lighter jackets but is very nice for winter or fall. What do you think of this material as an alternative? https://luxire.com/products/wool_herringbone_grey_white-lux_78370#/. It’s also on the lighter side but made of wool. Obviously the feel would be quite different. Probably suitable for jackets but not suits? Finally, on a different note, I’ve read that for lighter unstructured jackets, it’s better to go half canvassed rather than full canvassed. Would you agree? But in the real world, does a fully canvassed jacket really feel “hotter” than half canvassed? And would there be any other reason why half canvassed might be preferable in some circumstances? I’d be looking at 9oz and up for any jacket really, and I’d worry that this one (though a nice colour) might not wear very well. For cashmere, perhaps 11oz and up. And yes, you wouldn’t want that weight for a suit – far more problems with keeping shape and wearing through. No, half canvassed won’t really feel any hotter. I would always go for full canvassed, unless you deliberately want something that doesn’t keep the same line or drape. My understanding is also that a half-canvased jacket still has some light fusable so that there’s some structure to the lower part of the jacket, so a half-canvas jacket is probably less breathable at the top given the fusable (in addition to the canvas). And the bottom with fusable will probably also be less breathable than a full canvas where more breathable canvas is at the bottom. I agree with Simon that full canvas is the way to go. There may be benefit to going half-lined or quarter-lined if you want to lighten the jacket and have fewer layers in the bottom half. Not sure how well that works with full canvas as I’ve never had a jacket with that combination. Thanks for the clarification. So if I understand you correctly, when someone says a jacket is “unstructured,” they’re primarily referring to the use of padding or roping at the shoulders, or perhaps to the amount of lining, but not to canvassing. By the way, I thought the canvassing is done between the wool and the lining. So how is it possible to have a half lined fully canvassed jacket? Wouldn’t the absence of lining in part of the jacket expose the canvassing? No, when someone refers to ‘unstructured’ they normally mean shoulder padding, roping etc, and the weight or layers of the canvas – not how far it stretches down the jacket. It can also be used for jackets with no padding or canvas whatever though. Thanks for all your replies. How is canvassing done on a good top coat or trench? Should that go all the way down to the bottom? Would you define an anthracite grey, prince of wales blazer versatile? The pattern would be a good change for my wardrobe, but I wonder how well you can dress it down (jeans? chinos?) ?